ABF Mud Run - Are you ready to be tested? | Mud and Adventure | Outdoor Active Adventures Begin Here. Home Mud Run & Obstacle Race News ABF Mud Run – Are you ready to be tested? ABF Mud Run – Are you ready to be tested? This past April I decided to give ABF Mud Run a go on the recommendation of a few friends, and I was not disappointed. After the race I hung out and talked with race director Chad Mason. We were talking about all things obstacle racing and what was good about the race, and where improvements could be made. I could tell that Chad was interested in what I was saying and was taking in my thoughts. So I looked forward to the next ABF race to see what would happen. End of July Chad ran a training day at the Berlin, NJ ABF Mud site, this was to see what had been done since the April race. I have seen other races do training days, but really nothing more than workouts. Not a chance to actually go on obstacles, test them out, see where you have strengths and weaknesses. So this workout was spend about an hour working out as a group, then get a chance to attack the course and test it out. Afterwards another chance to give feedback so that it could be improved. Once again Chad listened to us and looked to create a course that would try to break even the most seasoned of OCR athletes. Fast forward to August 30th and Chad ran another training session. Same basic concept, but test out the new additions he has made to the course, and in about a mile course experience 23 obstacles and 4 water crossings. With the 23 obstacles, what happens if you fail one of them? Burpees…nope…body-builders…not here…at ABF it’s the quarter deck. What I feel is an epiphany Chad had from watching one too many episodes of Broken Skull Ranch. The quarter deck starts with 2x50lb sand bags for the men, and 1x50lb sand bag for the women. Bring the sandbag(s) from the starting point about 60 yards, drop them off. Return to the start point, grab a tire with a rope and handle, drag it to the sand bags, load them, and drag back to the start of the quarter deck, then return to the end of the obstacle you failed. After the team training we were split into either a head to head race or teams. As I will be racing on my own come October 4th in the Elite division, I ran head to head. This was a modified course so come race day things can/will change. After a short running start we grabbed tires and had a short run with them. Immediately after this the “fun” started. 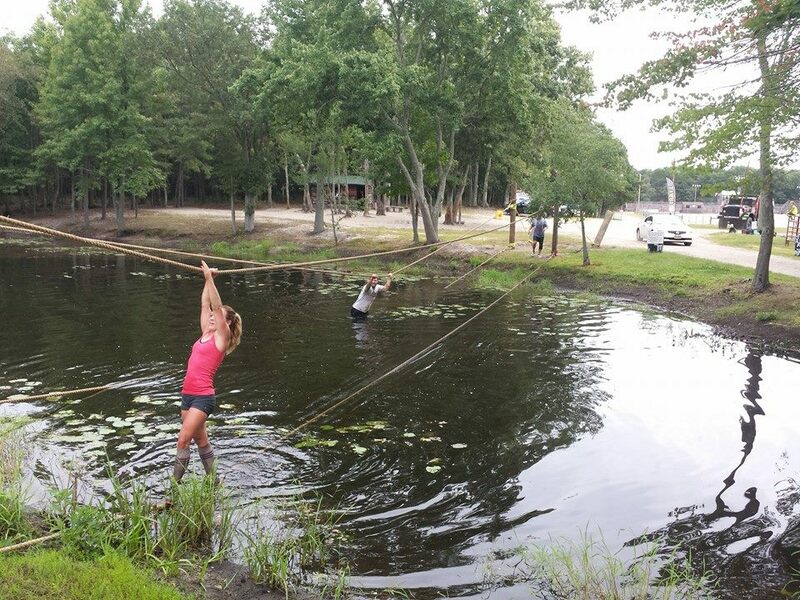 Two water crossing, followed by a hand and foot rope bridge. After this another water crossing, monkey bars, up a 16ft. roped wall, back in the water and a cargo net climb. Next we came to a rope traverse that took all but a few of us to the quarter deck. One of the others on the course looked at it and said “That’s longer than the one at Battlefrog”. How long, when I asked Chad, we are looking at 100ft. With your arms and legs taxed from the traverse it was onto a stump jump followed by a balance beam. Running through tires and a horizontal ladder followed. Across the water again, this time having to go under two sets of barrels. Right out of the water was a 15ft. rope climb and then inverted walls. At this point I was feeling muscle fatigue and had to take about 20-30 seconds at the next obstacle, an inverted wall, before I attempted it. After getting over this, came a short run to an 8ft wall. Then about 100 yards of running to the next series of obstacles, a log walk/balance beam, high log hurdle, and an inverted wall. Then the final run of about 200 yards to the end run of obstacles. A 4ft. wall, followed by a traverse wall, another 4ft. wall, then an 8ft. wall, some tubes to crawl through, and one last 4ft. wall. I was one of only a few that made it through the entire course without having to visit the quarter deck. 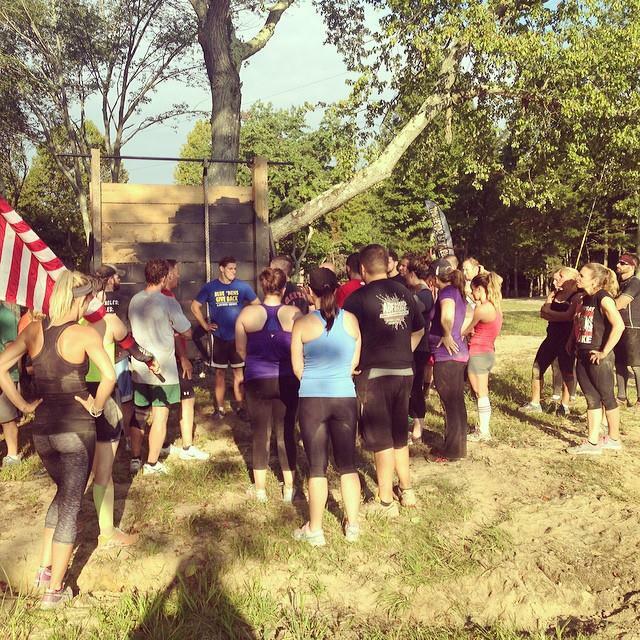 This was just a training day for ABF Mud run. Come October 4th, the obstacles will be getting moved around a bit and put into an approximate 4 mile long course. They are also looking to add in about another dozen obstacles. If you are in the NJ area and looking for a challenge either as an individual, or a team head over to http://www.abfmudrun.com/ and have a look at what this is about, and go to https://abfmudrun.webconnex.com/BerlinFall to sign up for what is looking to be an EPIC day of OCR. There will be a first wave Elite heat with prize money (for race day the only group that will have the quarter deck, the rest of the waves will not be penalized). After that will be open heats throughout the day. Want to get the kids involved, even better, there will be a 12:30 family wave so that you can run with your kids, either a 1 mile modified course, or go the entire 4 miles. Look forward to seeing you on October 4th, use code MUDANDADVENTURE for a discount. OCR has brought back that competitive fire in me that I had year's ago when I ran track in high school. You will see me out on most weekends at a race, or out training. The day's of just sitting around and watching life go by are behind me, I now make life happen. The OCR family is such a great community I have made so many new friends in the past year it is amazing how everyone gets along. I now have my wife and son engaged in being fit, as we are a fit family, and looking forward to doing some races together as a family. Looking forward to the next race when it's go time. chad..kudos to you for improving the mind, body and spirit of everyone who participates and trains with you. I was thrilled to see the picture of Debby on the rope challenge and can testify to the fact that she has been transformed into a true warrior under your guidance. God bless you with continued success. Just volunteering for you has been inspirational and lots of fun for me..